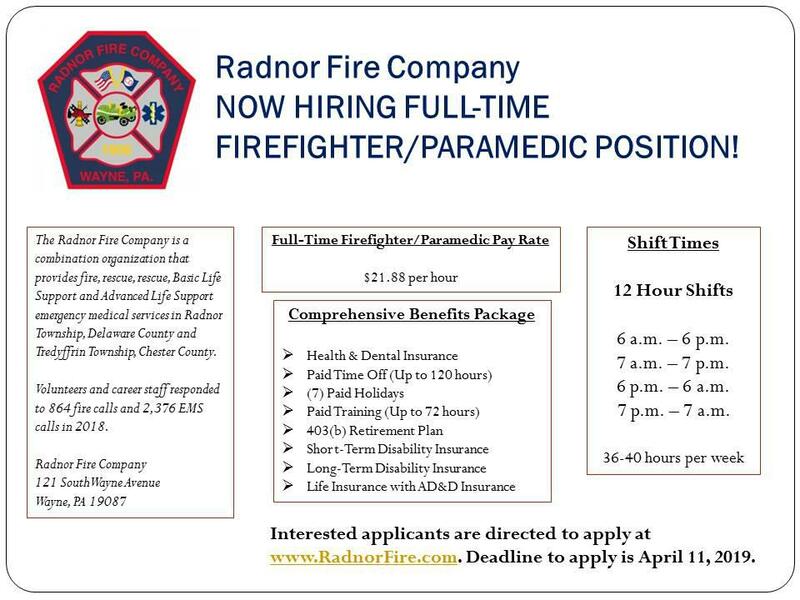 Radnor Fire Company - Now Hiring Full-Time Firefighter/Paramedic Position! 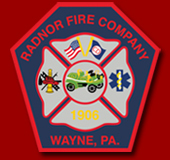 WAYNE, PA - The Radnor Fire Company (RFC) is currently hiring for the position of full-time Firefighter/Paramedic. RFC is a combination organization that provides fire, rescue, Basic Life Support and Advanced Life Support emergency medical services in Radnor Township, Delaware County and Tredyffrin Township, Chester County. Volunteers and career staff responded to 864 fire calls and 2,376 EMS calls in 2018. Qualified applicants are invited to apply by submitting an employment application, cover letter and resume to RFC at 121 S. Wayne Ave., Wayne, PA 19087 with attention to the Executive Office. Interviews will begin immediately after the application deadline of April 11, 2019.